A remarkable Roman burial has been found at Boscombe Down, Wiltshire. When archaeologists lifted the lid off a three tonne stone coffin they were surprised to discover that the coffin had not filled with soil. Instead, they looked down on the skeleton of a woman who was cradling a young child in her arms. A unique environment had been created inside the coffin. This had slowed down the processes of decay so that, even after 1800 years, the woman’s deer skin slippers still survived. The slippers had cork insoles and a fur lining and are the best preserved examples in Britain of this sort of luxury shoe which was imported from the Mediterranean. The child was buried wearing calf skin shoes which are unique in Britain. The woman also wore a necklace of Whitby jet round her neck, and on her right ankle was a bronze bangle. By her head was a small lustrous pot imported from France which would have contained drink for her journey to the next world. Everything points to the woman having been of high status. Almost 300 graves have been excavated at Boscombe Down in five separate cemeteries. Although many contained wooden coffins, this is the only one with a stone coffin. Dating to around 220 AD, the burial is the earliest in its cemetery and the later burials clustered around it. Many of the people in the other graves were buried with hobnailed shoes or boots for their journey to the next world and local copies of the imported pot are common finds. The coffin goes on display in Salisbury Museum on Monday 17th December 2007 where the finds from the important Bronze Age burial of the Amesbury Archer, which was found a few hundred yards away in 2002, can also be seen. The cemeteries found so far lie on the western side of the village and are close to trackways that led into the village. All of the cemeteries lie to the west of an ancient boundary. A thousand years earlier, during the Bronze Age, a long ditch had been dug as a land boundary. The ditch, which ran for kilometres, was 1-2 metres deep and about 2 metres wide. By Roman times the ditch had partly silted up, but it was still up to one metre deep and the Roman trackways had to cross over its course. The ancient boundary came to be used by the Roman village as a boundary. Beyond it they buried their dead. As is typical for this time, most of the burials are inhumations, and only a small number of cremation burials have been found. Only about a quarter of the people had lived beyond the age of 35. As was usual, infants and young children were not buried in the cemeteries. They were buried in the village. One local trait is the way in which a few graves in all the cemeteries were set within small enclosures, similar to grave gardens or gardens of remembrance. There may have been a small bank next to the ditch on which a hedge may have grown. All the cemeteries date to the third and fourth centuries AD, between 200 and 400 AD though some burials may date to the fifth century. Most of the cemeteries contain between 40-50 graves with one much larger one with at least a 100 graves. The ladies’ burial was found in the largest cemetery. There are subtle differences between each of the cemeteries. It is not yet known if this is due to them being of slightly date or because they were used by different clans of people, or groups who worshiped different gods. The number of burials excavated, combined with the facts that they come from different cemeteries associated with one village make the finds from Boscombe Down of national importance. Although there are subtle differences between the individual cemeteries, and detailed study of their remains is yet to be completed, the overall pattern is clear. Most people were buried on the back or on their side. Many were placed in the graves that were dug into the white chalk dressed in their clothes, or perhaps wrapped in a shroud. Many people were buried in wooden coffins, the only surviving traces of which are the iron nails used to fix the timbers together. Occasionally the head of the dead person had been separated from the neck and placed by the legs. This treatment of the dead is found regularly across southern England, though never in large numbers. It is not thought to have been the cause of death – by decapitation – and may instead have been a way of releasing troubled spirits. The mourners often placed things in the grave and these objects seem to be connected with a journey to the next life. The most common finds are shoes or sandals, though only the iron hobnails usually survive. Small pottery beakers to hold drink either on the journey to the next life or during it are also regular finds. Most of the beakers were made in the nearby New Forest potteries. Coins, usually thought to be for paying the ferryman Charon to take the dead over the River Styx, are also found occasionally. Other types of find are less common and are mainly to do with dress and appearance. They include bangles of copper alloy and of Kimmeridge shale, earrings, bone hair combs, and in one case, a jewellery box full of hairpins. The occasional finds of iron knive may also have been carried on a belt. The people of Roman Britain worshipped many different gods and it is likely that the most of the people buried at Boscombe Down will have been pagans, though a few may have been Christian. Where had the people lived? It is thought that the people buried in the cemeteries had lived in the nearby Roman village. The village, whose site is known today as Butterfield Down, was founded in the second century AD but was at its largest in the third and fourth centuries. Houses and yards lined the trackways that met in the centre of the village. One of the tracks ran between the Roman county towns of Dorchester (Duronovaria) to the south-west and Silchester (Calleva Atrbatum) to the north-east. The rectangular houses were made of timber and probably had thatched roofs. Most of the villagers will have been farmers and on the outskirts of the village were areas used for threshing and winnowing the crops of wheat and barley that they grew in small ‘Celtic’ fields. Small ovens were used to dry the crops before storage. The discovery of the bones of cattle and sheep show what types of meat were eaten and these were also the most common farm animals. Votive shafts about 3m deep and sited at the edge of the village were used to communicate with the gods of the underworld. Offerings to the gods were placed in the shafts. Near the centre of the village there are traces of a building built of stone. It is possible that this building was a temple. A small metal model of a bird may have decorated the end of a priest’s sceptre. A small hoard of Roman gold coins from the village dates to early in the fifth century AD is one of the latest coin hoards from Roman Britain. 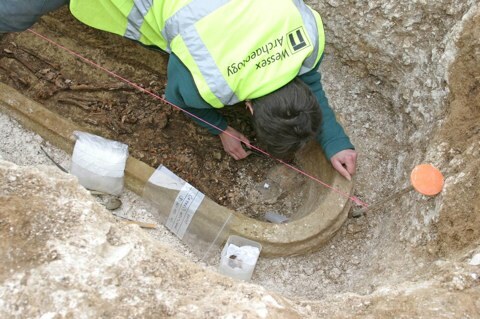 A stone coffin containing a Romano-British woman and child was found during excavations by Wessex Archaeology at Amesbury in 2007, as part of a large housing development. A large number of Romano-British graves in several distinct cemeteries have so far been uncovered as part of this development, although this is the only grave so far found to contain a stone coffin, suggesting that this woman was of some status within her community. The woman was wearing cork-soled slippers and the child a pair of calfskin shoes, in both cases extremely rare survivals, and direct parallels have not so far been found in this country. The coffin also contained a complete imported French pottery vessel as well as a copper alloy anklet and a string of jet beads. The child’s calfskin shoes were well preserved, particularly that for the left foot. Approximately 80% of this shoe survived, although the sole had separated from the upper. The shoes were stitched, and appeared to be ankle shoes, fastened with laces. All the fragments of the shoe were recorded before the pieces were cleaned and consolidated. The shoe had been squashed sideways, but the general shape can still be seen. The shoe is kept in a controlled environment to increase its chances of long term survival. To find out more about our work on Amesbury Down follow this link.